Here at Luv R Blinds, we believe that quality always matter when it comes to your home, and this includes the blinds, shutters, and shades that you decide to make use of on and inside your home. Whether you are completely set on your next window treatment option, or you are still looking for a little bit of advice and inspiration before you make your final decision, our team of experienced window treatment professionals at Luv R Blinds can give you the advice you need to find the perfect option for your home, and the quality workmanship and customer care you can count on to ensure you get the quality installation you deserve to allow you to enjoy your new window blinds, shutters, or shades now and for many years to come. Ever since we first opened the doors of our Norco, CA window blinds and shutter company to the public back in 1992, our team of professionals have worked hard to earn the reputation among local homeowners that we enjoy today. We have earned this reputation by making it a point to never settle for anything less than the absolute best when it comes to the results of our service. This uncompromising commitment to quality in everything we do is part of what has made us the premier name in blinds, shutters, and shades throughout Norco, CA and the surrounding areas. Our team of professionals here at Luv R Blinds understand that the quality of your work can only be as good as the materials with which it is performed. That's precisely why we make it a point of pride to use only the highest quality window treatments from some of the industry's leading manufacturers in all of our work. If you have any questions about our full line of high quality blinds, shutters, or shades and the services we provide for them, or if you would like to schedule an appointment for consultation with one of our skilled specialists for a free estimate, give us a call today. Our team of experts are always standing by and would be more than happy to help. Blinds are, and most likely will always be, one of the most popular window treatment options on the market among homeowners all across the country. Here at Luv R Blinds, our team of experienced professionals will work with you directly to identify what exactly you are looking for when it comes to your new blinds in terms of both function and design, and will go over the many different options that are available to you. We will go over each option with you and highlight the benefits of each one, and how they can benefit your home. After you have made your final decision, our team of experts will get to work installing your new blinds so that you and your family can start enjoying them as soon as possible. 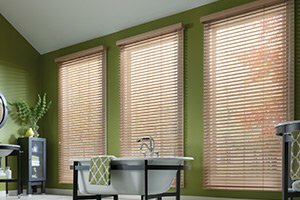 We have a wide range of different options available, from warm looking natural wood blinds, to cost effective faux wood blinds if you are looking for something with that look, but would rather have your dollar stretch a little farther. We also have a wide selection of vinyl, aluminum, and mini blinds if the windows in your home are oddly sized. When it comes to finding the right shutters for your Norco area home, one of the trickiest parts can be to take into account how it is going to affect both the interior and the exterior aesthetic of your home. On the outside of your home, your shutters can either hurt or improve the curb appeal of your home, depending on whether or not you have the right options in place and they are installed properly, and on the inside of your home, they can either make or break your home's interior design scheme. In addition to their aesthetic benefits, the right shutters can also help you control the amount of light that is allowed into your home, helping to reduce the build up of heat in your home, filter out harmful UV rays, and improve the overall comfort of your home. 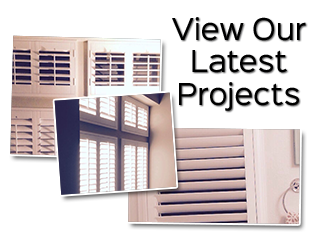 Here at Luv R Blinds, we have several different shutter options for you to choose from. From high efficiency polycore shutters, to elegant looking plantation shutters, our team of experts can help you find the perfect option for your home. If you have never considered the combination of beauty and function that a brand new set of high quality shades can bring to your home, now might be the perfect time to start considering. Just like all of our other high quality window treatment solutions, we have a wide variety of different materials, designs, and colors when it comes to our shades, and we guarantee that we can help you find the perfect option for your home based on your functional and aesthetic needs. 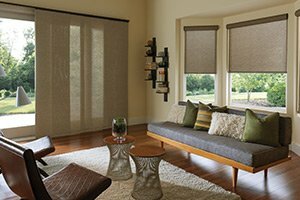 Here at Luv R Blinds, we have four basic types of shades that we offer to all of our customers, including cellular or honeycomb shades, Roman shades, roller shades, or woven wood shades, and each one brings its own unique look and benefits to your home. There is no need for you to get overwhelmed when looking for new shades at all of the many different options there are out there. When you make the call to our team of professionals here at Luv R Blinds, you can rest easy knowing that you have industry experts on hand to ensure you get exactly what you need for your home. Here at Luv R Blinds, we believe that no window treatment service is complete without ensuring that you have access to all of the additional services you need to ensure that your new blinds, shutters, or shades meet all of your needs. If you are looking for a way to make the process of controlling the amount of light that comes into your home a bit easier, or you are just tired of cords, wands, and strings, we offer a complete line of motorization services to give you complete control at the push of a button. In addition, if you have a wonderful view out of the windows of your home, but you are looking for a way to tone down the glare and level of brightness without obstructing your view, it might be worth looking into our full line of high quality window films and solar films. These can be a particularly good option if you have bay windows or the like that you enjoy looking out of, but wish they weren't quite as bright. Here at Luv R Blinds, our team of blinds, shutters, and shades specialists believe that you should never have to settle for second best when it comes to your window treatments for your home, and that's precisely why we work so hard to deliver you nothing but the best in each and every service we are called on to perform. With over twenty years of experience in the local area, we are one of the most experienced window treatment services in the local Norco area, and we use that experience to ensure our customers get nothing but the best. 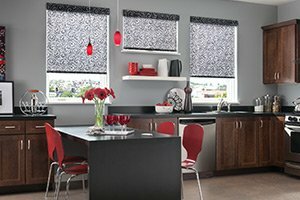 For all of your window treatment needs, there is no one better suited to the task than the team of experts here at Luv R Blinds. 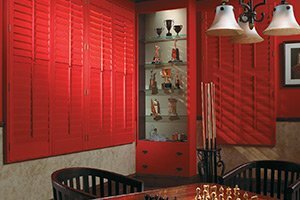 If you are looking for a window blinds, shutters and shades company in the Norco, California area please call 951-736-9650 or complete our online request form.